next Keith Varney who talked about how he was inspired by Tim Phillips' Play:Here We Exemplify' in creating his ceramic vases . and then a gathering of the six ceramicists who came to talk about their work. To find out more about these amazingly talented ceramicists, please click on their names and you'll find more about them from their websites. Meanwhile you have until February 4th, which is next Saturday to have a last look at the exhibition. Today Sophie Cummings gave a talk at lunchtime on the 'From Where I'm Standing' exhibition, in which 10 ceramicists were asked to respond to a couple of works from the collections. They have produced a huge variety of different ceramics. Here, below,Sophie is talking about Fenella Elm's response to the small piece which has influenced so much of her work, I've looked at her piece which I love, many times, but it wasn't until today I saw something completely different in it. There were quite a few people who came along to to find out more about the exhibition, and more came during the talk. Jo Taylor took over from Sophie to talk about her work, here she is, below, talking about Nicholas Horsfield's painting 'Oval 1979 Evening, Downstream Towards Vernon' which she responded to in coloured porcelain. Jo talked about how she first came across the painting in the storeroom at very close quarters and was immediately impressed by the feel of the painting, the colours, splashes of apricot and lilac colours which she reproduced using coloured stains on the porcelain. And here are 2 of Jo's pieces below, she has called them 'Riffing on Horsfield', there are 2 more elsewhere, another 'messier' one she has at home in her dining room, and there's another larger one. They are amazingly beautiful in texture and colour, they enhance the painting, and the painting enhances them in a lovely way. Before leaving the gallery, I noticed the Fenella Elm's piece produced the most amazing shadows, somehow I'd missed the shadows previously. 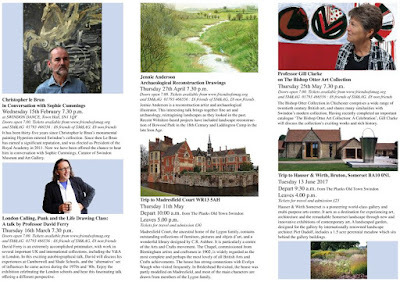 During January 2017, the Osborne Samuel Gallery has offered Swindon Museum and Art Gallery, space for a month at 23a, Bruton St, London W1J 6QG to give the collection some much merited publicity. Many of the 'home team' were invited along to see the results of hanging approximately 30 selected works in the gallery, along with some choice ceramic pieces. It was a lovely evening, the hang was beautifully done and looked fabulous in the gallery. I'll start with the speeches, Robert Hiscox was speaking as I took the photograph, he'd taken over from Councillor David Renard, Leader of Swindon Borough Council, they explained the history of the collection, the need to move from the current inadequate premises, and their hopes for the future when the museum and art gallery will be housed in a new purpose built cultural centre in the heart of the town. The evening was opened by Gordon Samuel, one half of the Osborne Samuel partnership, he's to the right of David Renard in the photo. There were some lovely ceramics pieces hung at eye level and so were very easy to examine. Above we've got Grayson Perry's Perfume bottle and 3 stoppers, and on the far right Hans Coper's Spade Vase, and Lucie Rei's Bottle Vase to the left of that. Beside that case was another with among other things, Geoffrey Swindell's Oval Forms purchased in the late 1970s. The gallery was packed making it hard to take photos, these below were taken as the rooms emptied a bit. Below you can see Councillor Garry Perkins, Cabinet Member for the Economy, Regeneration and Skills at SBC, he's near the model for the proposed new museum and art gallery, on display in the centre of the middle room in the gallery. Below a general view of people, Nicky Alberry can clearly be seen on the left. Gillian Ayres' painting 'Florestan' zinged with energy and colour, it looked great illuminated perfectly, with a wall to itself. Do go and have a look at the exhibition if you can, it's there until 11 February and the gallery is open Monday-Friday 10am-6pm, Saturdays 10am-2pm. I have just added our talks and trips for the first half of 2017 to the blog, and I'm hoping our website will be updates later on today to reflect this programme. We are still in the process of learning how to use the website, so it's not all running totally smoothly at the moment. The intention is to be able to buy tickets for talks and trips online so you can do this at your convenience. 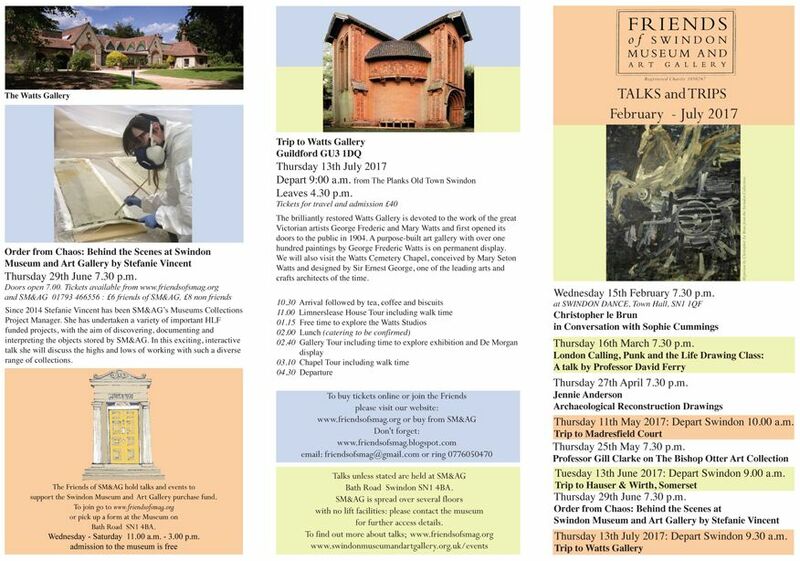 All members of the Friends will receive an eflyer this morning, hard copies are available at the museum, but the cost of postage makes it too expensive to post them. 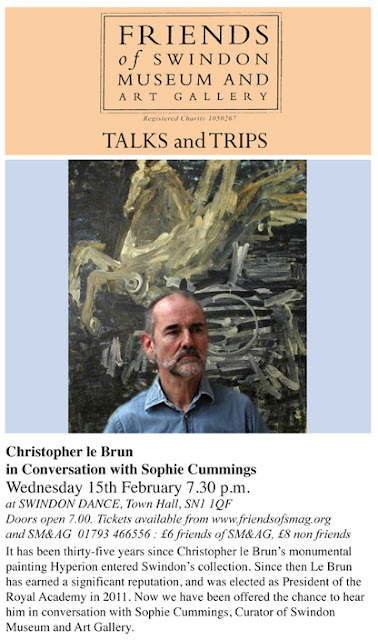 We are very excited to have Christopher le Brun as our first speaker, seen in the poster below standing in front of his painting 'Hyperion' purchased by SM&AG 35 years ago. Painter, printer and sculptor, he was born in Portsmouth and trained at the Slade and Chelsea Schools of Art in London, Le Brun first appeared in several group exhibitions, such as the influential Zeitgeist exhibition at the Martin-Gropius Bau, Berlin, and from 1980 onwards, in many solo exhibitions in Britain, Europe and America. He was a prizewinner at the John Moores Liverpool exhibitions in 1978 and 1980 and worked in Berlin during 1987-88 as guest of the DAAD artist’s programme. Apologies that the flyers are fairly illegible, the synopsis of the talks and trips appears on the talks and trips page of this blog. I thought it was worth flagging up what's happening this year.